A touchingly honest, candidly hysterical memoir from breakout teen author Maya Van Wagenen. Stuck at the bottom of the social ladder at pretty much the lowest level of people at school who "aren't paid to be here," Maya Van Wagenen decided to begin a unique social experiment: spend the school year following a 1950s popularity guide, written by former teen model Betty Cornell. Can curlers, girdles, Vaseline, and a strand of pearls help Maya on her quest to be popular? The real-life results are painful, funny, and include a wonderful and unexpected surprise - meeting and befriending Betty Cornell herself. Told with humor and grace, Maya's journey offers readers of all ages a thoroughly contemporary example of kindness and self-confidence. As I said in my November book haul (ahem, you should go and watch it if you haven't already) I didn't have high expectations for this book at all. I was offered this book to review a few times last spring, and I politely declined every time. At the time, I wasn't interested in non-fiction, and I guess the cover put me off so much that I didn't look into it enough to realise this wasn't some random book for tweens wanting to be popular. But then I won a copy, and at the time I was far, far behind on my Goodreads challenge, so... I read it. And I'm so glad I did. Have you ever wondered what would happen if you took all of the cliques at your school and mixed them up? Or why it's not socially acceptable to wear clothes that were once at the height of fashion but, for some unknown reason, aren't anymore? Or why you feel like there are certain people you're not allowed to talk to because they're different? That's what Popular is about. It's not fluffy and it's not a guide on how to become the Queen of the school. It's the fascinating record of Van Wagenen's social experiment, and the successes and downfalls as she applied tips from a century ago to adolescent life as we know it now. Personally, I've never tried to fit in so there were one or two moments where I thought, "why is she going through such lengths to be popular? Why does it matter to her whether everyone likes her or not?" But she ended up having a huge and positive impact on everyone around her, and then I understood. She just wanted to free everyone from the rules of society, and I have lots of respect for the time and dedication she injected into her project. And guess what? The writer was around fifteen years old when this book was published. I'd say she'll go far, but she's already gone miles and miles. I hadn't thought I was going to read this, but then I couldn't stop. It's such an interesting book, especially because it's a true story. Popular is truly thought-provoking and, within the couple of hours it took me to read it, it changed my perspective on life. I think this is a prime example of why you shouldn't judge a book by its cover. Or, alternatively, why publishers should spend a bit more time thinking about how the cover will affect sales. That's really cool that the author was fifteen when the book was published. It gives me hope for my amazingly talented best friend/writer. I'm not a huge fan of the cover, either, but I am a huge fan of the book itself. I've always loved memoirs, and this one sounded really interesting. 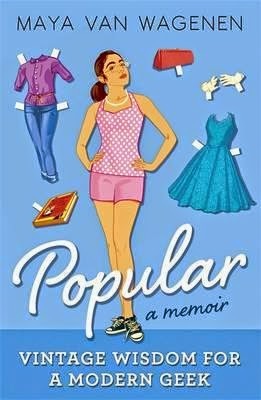 I'm so glad I read Popular because it really opened my eyes, and I loved seeing how Maya positively impacted her classmates. I also loved her writing style. It was witty and deep at the same time, which is a difficult thing to pull off.